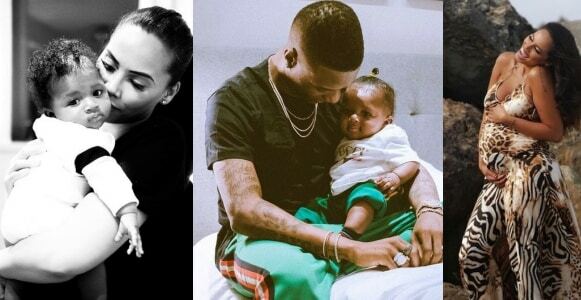 Wizkid’s manager and baby mama, Jada Pollock has caused a stir on social media after she hinted on being married to the singer while celebrating mother’s day. 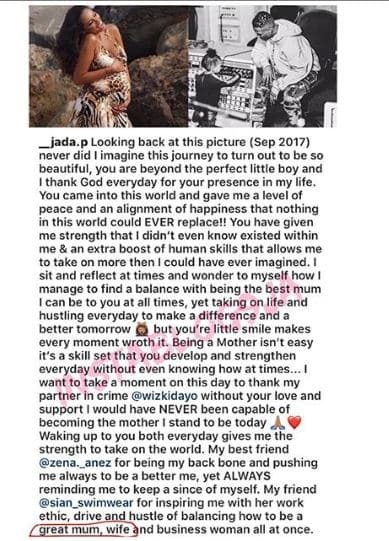 While sharing a photo to celebrate herself on mother’s day, Jada thanked her friend for inspiring her to be a great mum, wife and businesswoman. The wife part has left her fans with a lot to talk about. Looking back at this picture (Sep 2017) never did I imagine this journey to turn out to be so beautiful, you are beyond the perfect little boy and I thank God everyday for your presence in my life. You came into this world and gave me a level of peace and an alignment of happiness that nothing in this world could EVER replace!! You have given me strength that I didn’t even know existed within me & an extra boost of human skills that allows me to take on more then I could have ever imagined. I want to take a moment on this day to thank my partner in crime @wizkidayo without your love and support I would have NEVER been capable of becoming the mother I stand to be today 🙏🏽❤️ Waking up to you both everyday gives me the strength to take on the world. My best friend @zena._anez for being my back bone and pushing me always to be a better me, yet ALWAYS reminding me to keep a since of myself. My friend @sian_swimwear for inspiring me with her work ethic, drive and hustle of balancing how to be a great mum, wife and business woman all at once. My soul sisters @tobiah_roosevelt & @rinne_aminah_ who gave me a step by step manuel on how to be an incredible mother without even knowing it! My lil sister @skylatylaa who is my cheerleader in everything I do and who is always there when ever I need & has never let me down. My mum who I can count on at ALL times and makes my life so much easier when she comes in on days and takes control. My lil brother @jay_caprice who is always there when EVER I need him to be without a question and my dad for being a whole mood in anything I need him for.